Got some hiss? HUSH it up with this pedal. You asked, and now you receive. 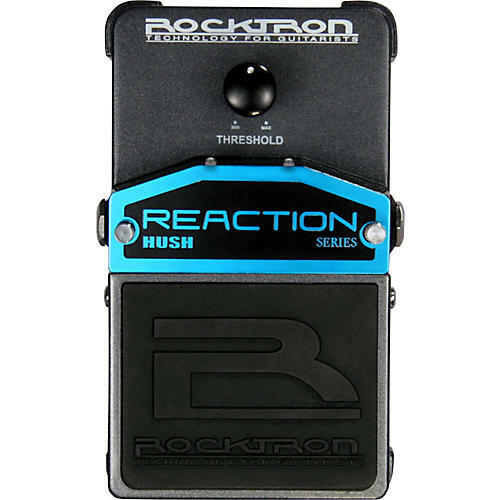 The Rocktron Reaction HUSH noise reduction pedal, when used properly, wipes out hiss, unwanted feedback and pickup buzz. The Reaction HUSH delivers 65dB of signal cleanup, while your music signal integrity remains unaffected. In other words, you get rid of the noise without altering your tone. Rocktron's Reaction Series effects pedals are built into a rugged metal slim form factor chassis, taking up as little space as possible on your pedal board. The Reaction HUSH is a true bypass pedal: when you turn it off-it is out of your signal path. Plug the Rocktron Reaction HUSH in after distortion boxes, wahs, noisy vintage effects, or other noisy units and turn the THRESHOLD control knob until the noise goes away. It's that easy. Unlike noise "gates" that chop off the end of your notes, or ruin your sustain, the Reaction HUSH is actually a form of single-ended noise reduction that tracks your signal all the way and pushes the noise floor down below the point where your ear can hear the noise. The Reaction HUSH will not alter your sustain or chop the end of your notes. Simply use the Threshold knob to smooth out your signal while saying goodbye to noise forever. Here's more HUSH tips: For maximum noise reduction results, place the Reaction HUSH after your distortion and modulation effects (chorus, flanger, phaser, etc.) but before any delay or reverb effects. If you are already comfortable rolling back your guitar's volume pot, simply turn your distortion and other effects in the chain before the HUSH to "on", roll back your volume pot, adjust the HUSH Threshold control to remove any hiss you hear, and you are ready to go. Make sure you pay attention to the proper setup by placing the Reaction HUSH AFTER your noisy stompboxes or in your amp's effects loop. The Reaction HUSH is NOT designed to take the input directly from your guitar without some processing happening between the guitar and the noise reduction. When setup correctly, with your signal going from your preamp and effects, or from your distortion and effects, into the Reaction HUSH, you will love how it cleans up the excess noise, including pickup buzz. The Reaction HUSH can also be used in your amplifier's effects loop. However, if you are running multiple effects through this loop, the HUSH should always be the last dynamic device in the signal chain, but before digital delays or reverbs. The Rocktron Reaction HUSH will give you the same great HUSH noise reduction used by thousands of high profile artists for years. Add true bypass and the Reaction HUSH becomes a great addition to any pedal board. The footswitch on the Reaction HUSH controls On/Off status as shown by the LED indicator. Reaction stomp boxes run on a 9V Alkaline battery, or may also be powered by Rocktron's DC OnTap Universal Power Supply adapter.